RUSH: Elizabethtown, Kentucky. This is Duane. Great to have you, sir. Hi. CALLER: — he may have driven away five plus million NRA members and pro-Second Amendment voters. RUSH: No — see, you need to remember also what I said that day. Right after those comments about additional gun control regulations, I reminded everybody once again that Trump says things in these meetings in front of the cameras that are not what he really thinks, and it’s part of his negotiating style. Lo and behold, Duane, I’m glad you called, because I can make your day. Two stories. Reuters angry as they can be: “In Bow to NRA, Trump Throws Gun Purchase Age to States, Courts — Under pressure from gun rights groups, President Donald Trump backed away on Monday from raising the minimum age for gun purchases from 18 to 21.” So what he told Feinstein is no longer applicable, Duane. And Feinstein’s not happy about it. From TheHill.com: “Sen. 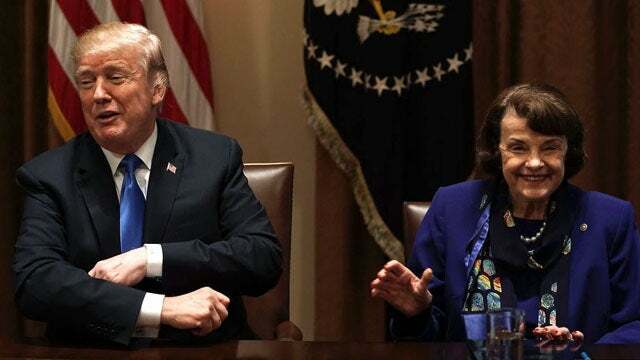 Dianne Feinstein (D-Calif.) on Monday ripped President Trump’s plan to ‘harden’ schools against armed attacks, saying he ‘caved’ and his pledge to back tougher gun laws is ‘hollow. '” So it is exactly as I thought. He says things in these televised — like he did on immigration, with Dianne Feinstein and DACA, and now here on gun control. He says these things, it’s part of his negotiating style when the cameras are on. But when the rubber hits the road, there’s no change, everything’s fine, Duane.